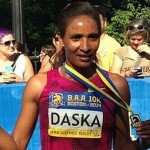 BOSTON – (October 13, 2013) – 2013 Boston Marathon champion Lelisa Desisa (ETH) and Kim Smith (NZL) won the 13th B.A.A. Half Marathon, presented by Dana-Farber Cancer Institute and the Jimmy Fund, under sunny skies in Boston’s Franklin Park. Desisa and Smith both broke the event record on this rolling course through Boston’s picturesque Emerald Necklace park system, Desisa finished in 1 hour, 34 seconds and Smith’s winning time was 1:09:14. Stephen Sambu (KEN), who placed third today, and Smith won the 2013 B.A.A. Distance Medley and earned $100,000 each. The 13th B.A.A. Half Marathon is the third and final event of the 2013 B.A.A. Distance Medley, a three-race series which combines the B.A.A. 5K on April 14, the B.A.A. 10K on June 23, and the B.A.A. Half Marathon. Sambu, 25-years old, and Smith, 31, won $100,000 each as the male and female with the fastest cumulative time in the three-race series. Desisa, 25, remembering his victory in the 117th Boston Marathon just six months ago, smiled at the cheers from the crowd at the finish line inside White Stadium. “I like the people of Boston, and I am considering myself now one of the people of Boston,” said the reigning Boston Marathon champion. Desisa will be remembered in Boston for more than his victory on April 15, 2013. He also returned for the B.A.A. 10K on June 23, where he gifted his Boston Marathon winner’s medallion to Mayor Thomas M. Menino in a gesture of solidarity with the City of Boston and as a tribute to those who were affected by the events of April 15. Following the B.A.A. 10K, Sambu held a 26-second lead over Daniel Salel (KEN) on the B.A.A. Distance Medley Leader Board. 2012 B.A.A. Distance Medley champion Allan Kiprono (KEN) and 2012 B.A.A. Distance Medley runner-up Lani Rutto (KEN), were both within one minute of the overall lead. In the early stages of the race, a pack of more than ten runners controlled the pace, passing the first mile marker in 4:26, two miles in 9:06, and reaching 5K in 14:11. Kiprono and Rutto led the pack by a step in these first few miles, as Rutto took the pace-setting duties until the sixth mile. Passing the 10K mark in 28:17, Kiprono made a move to take the lead by a step, but the pack remained largely unchanged. By the eight-mile mark, the lead pack was narrowed to Sambu, Salel, Kiprono, Desisa, and Sam Chelanga (KEN). Following a 4:22 mile split in the ninth mile, Salel and Sambu took the lead and raced side-by-side. 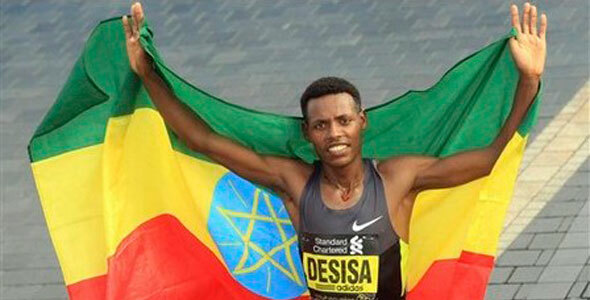 The crowd inside White Stadium stood and cheered as Desisa broke the tape in 1:00:34. Salel and Sambu finished second and third, respectively, and both were recorded with a time of 1:00:41. Also finishing under Kiprono’s old event record of 1:01:44 were Chelanga and Rutto, finishing in fourth and fifth respectively. After the race, Sambu, who lives and trains in Arizona, discussed his plans to use his $100,000 grand prize winnings in the B.A.A. Distance Medley to buy water purification resources for his native village in Eldoret, Kenya, where his family still lives. For the second consecutive year, New Zealand Olympian Kim Smith asserted her dominance at the B.A.A. Half Marathon, claiming victory in a course record time of 1:09:14. The 31-year-old resident of Providence, R.I., led from start to finish, going on to successfully defend not only her race title, but also the B.A.A. Distance Medley crown. With her win, Smith becomes only the second women’s champion in race history to win the B.A.A. Half Marathon two years in a row. Shortly after leaving the start in Boston’s Franklin Park, Smith found herself out front with Ethiopia’s Aheza Kiros and Kenya’s Alice Kimutai tagging alongside. 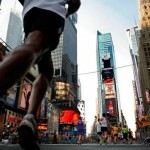 The three would pass five kilometers in 15:52, then five miles in 25:39. Running in her first race since June’s B.A.A. 10K, Smith came into today’s event holding a one minute, eleven second advantage in the B.A.A. Distance Medley standings. Knowing she would have to push the pace for her chance at the $100,000 grand prize, Smith kept her foot on the gas pedal, leading every step of the early miles. Together through 10 kilometers in 31:48.7, it appeared Smith and Kiros would race neck-and-neck through the final half of the contest. But moments before reaching the seven mile mark, Smith put any thoughts of a duel to rest. Pumping her arms ferociously, the three-time Olympian eased away from Kiros. A five second lead soon became ten seconds, then 34 seconds at the nine mile mark. “Once they dropped off I knew they must be tired, and I felt pretty good at that stage. I thought ‘I think I got it,'” Smith said. All by herself, Smith continued to push over the latter stages of the race, through Franklin Park Zoo and into White Stadium with no woman in sight. By then it was clear the previous course record of 1:10:52 would be beaten. The only question was by how much. The answer wound up being one minute and 38 seconds, as Smith broke the tape with 1:09:14 reading on the clock. Though she easily secured the course record, Smith said it was never on her mind. Defending her race title and picking up the B.A.A. Distance Medley victory was a thrill, Smith added. Behind Smith, Kiros would finish second in 1:10:03, with Kimutai third in 1:10:37. Kristen Fryburg-Zaitz was the top American in fourth, timing 1:13:12. Joseph Ekuom, of New York, won the Masters (40 and older) division in 1:13:38, while Scituate, MA resident Holly Madden captured the women’s Masters crown, running 1:28:01. Behind the day’s top finishers, an event record crowd of 6,535 participants started the race. Also in the field were nearly 650 runners representing Dana-Farber Cancer Institute, who are raising funds to improve patient care and cancer research at Dana-Farber. The B.A.A. Half Marathon has been presented annually by Dana-Farber Cancer Institute and the Jimmy Fund since 2003. Dana-Farber runners have raised more than $4 million USD through this event over the past 11 years.